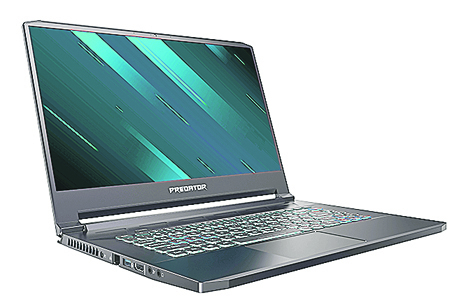 Acer unveiled two new Windows 10 gaming notebooks, the Predator Triton 900, a 17-inch performance notebook featuring a slim design and convertible 4K display—and the Predator Triton 500—a 15-inch all-metal gaming powerhouse measuring just 17.9 mm (0.70 inches) thin. Both gaming notebooks combine new, functional designs with powerful internals that rival gaming desktops. The Predator Triton 900 and 500 both earn their gaming cred with Acer’s advanced cooling system that includes 4th Gen AeroBlade™ 3D metal fans that increase airflow by 45 percent, and Coolboost™ technology that keeps the notebooks cool during extended gaming sessions and while playing demanding AAA titles. 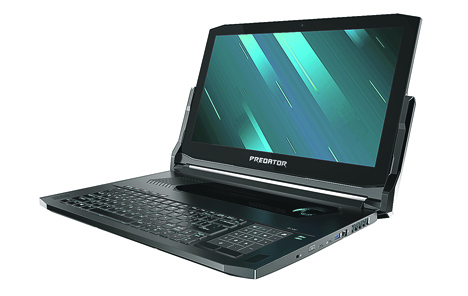 The Predator Triton 900 is a gaming notebook in an inventive form factor with innovative new design features. It features a CNC-machined Ezel Aero Hinge™ that flips, extends, or reclines the 17-inch display. Users can switch between four usage modes: Display mode for sharing the screen with friends during gaming sessions, Ezel mode for playing games on the touch screen, notebook mode for traditional gaming scenarios, and stand mode—effectively turning the Triton 900 into a tablet for gaming or using creator tools. The Triton series 900’s trackpad is placed beside the keyboard, giving users natural hand placement for gaming using both the keyboard and trackpad. It’s also amazingly thin at just 23.75 mm (0.94 inches). Featuring the new NVIDIA® GeForce RTX™ 2080 GPU and a 4K IPS display with NVIDIA G-SYNC™ technology, the Predator Triton 900 pulls no punches in bringing gamers a best-in-class gaming experience. With up to a six core high performance 8th Gen Intel® Core™ i7 processor, NVMe PCIe RAID 0 SSDs, and up to 32GB DDR4 memory, gamers can power up the most demanding games and expect smooth, tear-free gameplay. It comes with an Xbox wireless receiver that lets users play their favorite PC games on Windows 10 with an Xbox controller. To round out the package, it features audio by Waves. Waves Maxx™ delivers superior sound quality made immersive with Waves Nx™ with head tracking for a hyper-realistic 3D audio experience. The Predator Triton 500 features up to NVIDIA GeForce RTX 2080 GPUs with Max-Q design, up to 8th Gen Intel Core i7 processors, NVMe PCIe RAID 0 SSDs, and up to 32GB DDR4 memory. Its GPU is overclockable and VR-Ready, letting gamers enjoy the latest cutting edge gaming and VR experiences. The 15.6-inch 300 nits IPS display brings games to life with 144Hz refresh rates in overdrive at 3ms. NVIDIA G-SYNC technology creates fluid images as they zip across the screen while gaming or watching movies. Available later this year, the PredatorSense mobile app gives control of the Predator PC from a smartphone. The app can control settings for overclocking, fan speeds, lighting, and audio modes. Users can show active lighting profiles preset on the PC, or switch lighting profiles remotely. Additionally, users can view and set customized macro key sets for physical hotkeys. Is drone hunting a sport?